The manufacturing and process industry will tend to integrate the automation of production plants and the activities supporting production; this will result in an outstanding development of the systems that constitute the interface between the control systems of the production and the resource planning systems, with higher automation in production, too. Fig. 1 – Pneumatic handling actuators: pneumatic cylinder, rodless cylinder, rotary pneumatic motors, Cartesian linear system by OMAS Company at Druento, near Turin. In modern plants, the compressed air plays a fundamental role in production processes, where motion is protagonist. For the material and product handling, pneumatic plants use actuators whose motion is controlled by mechanic and mechatronic systems [1, 2]. The need of maintaining competitive positions in a more and more competing global market constitutes an important driver for the adoption of technologies that allow improving the use of productive assets. In this ambit, automation and process controls play a fundamental role. 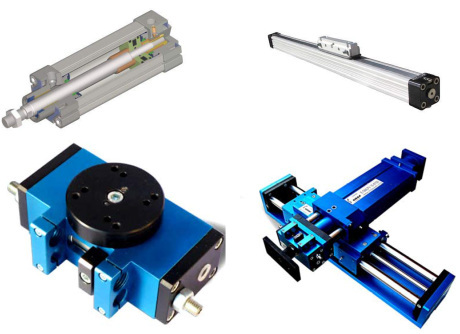 Linear pneumatic actuators, pneumatic cylinders constitute the simplest and immediate among pneumatic actuators and they are classified as actuators or motors: they can transform into mechanical energy another form of energy, in the specific cased potential pressure energy. Different and various realizations are possible for cylinders, depending on the opportunity related to motion needs. Concerning this, rodless cylinders are interesting. These are linear type actuators constituted by a cylinder where the piston is directly connected to the load and performs the mechanical work without needing the rod interposition, in order to achieve strokes as long as the actuator overall dimensions. If we need a rotary motion, it is possible to use pneumatic rotary motors equipped with an output shaft able to perform alternated or continuous rotations. These motors generally belong to two typologies: vane motors and cam motors [3-5]. Particular types of actuation for special motions are those realized with flexible actuators or with pneumatic muscles. These actuators exploit, for their operating principle, the high compliance of baffles and walls made of deformable materials, generally elastomer. Among them, an important role is played by the so-called pneumatic artificial muscles, often indicated with the acronym PAM (Pneumatic Artificial Muscle). These muscle fluid actuators are cheap, light and able of big actuation forces, without sliding, equipped with static seals, able to work with different, cheap, safe and non-polluting fluids; they can withstand hostile environments and they can easily operate in case of assemblies with significant misalignments, besides, they are suitable for undergoing rapid maintenance interventions on machine board, too. Fig. 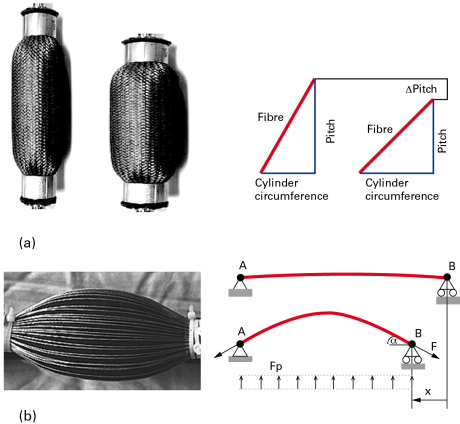 2 – Schemes and examples of crossed-fibre flexible actuators, McKibben type, and with straight fibres [6-9]. In figure 2a, we can see the configurations taken by these actuators for various pressure values in the chamber and an image of a McKibben muscle [6-9]. The behaviour of a McKibben muscle fibre is described in figure 2a, where an inextensible fibre, wound on the cylindrical chamber – first with minor diameter and then with major diameter owing to pressurization, as it has to travel a helix on the surface of a cylinder with increased diameter –will describe a helix with minor pitch. The number of turns, in fact, remains the same because the fibre is constrained to the extremity heads. Another type of pneumatic muscle is represented by the straight fibre muscle that, geometrically, can be seen as the McKibben muscle, where the fibre helix pitch tends to infinity. An example of this muscle type is represented in figure 2b: the photography shows a prototype of this muscle type and, in the same picture, we can see the scheme of a not-deformed and deformed fibre, undergoing the pressure load, in its radial component Fp, and at the value of external F load, competent to a fibre. From the balance of the single fibre we can see that Fp=2F sin(a), therefore, the fibre subjected to the pressure load performs the stronger F traction the smaller is the a angle. 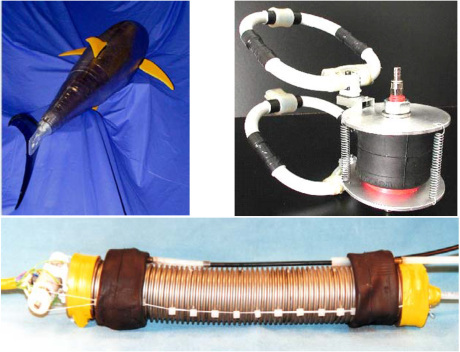 Flexible actuators are successfully used also in the implementation of mobile robots with tasks of exploration, detection an intervention in emergencies. The industrial handling is strictly connected with the industrial automation, which is the whole of methodologies of automatic controls and mechanical, electric, electronic and computer methodologies that permit the automation of productive processes. This in order to use the machines while reducing the direct human intervention and with lower costs, higher efficiency and reliability and continuity of the operations carried out, from the point of view of involved times and of the constant quality of process and product. The automatic handling is specifically suitable for operations that do not need impossible precision, repeatability, speeds and powers for a human operator . A standard case of automated handling application is the pick and place. Pick and place handlers execute repetitive activities quickly and accurately. Robotic pick and place applications are designed to carry out the work in such a way as to rely on constant machining quality in time. Pick and place systems are often coupled with a vision system, they tirelessly perform big quantities of repetitive movements, providing reliable solutions for productive lines with constant quality in time. Besides accelerating cycle times, pick and place systems work with constant and quantifiable accuracy and uniformity in comparison with manual machining, affected by the operator’s tiredness, quality uncertainty due to the different skilfulness of operators, their human mood and health. In general, the automatic handling is widely used for dangerous operations, to comply with binds and regulations concerning safety and environmental impact. The study of automated systems has led to the theory of automatic controls, Automatic core; on the basis of measurements carried out on accessible physical magnitudes, we define the most effective control action to obtain the desired process by using a feedback scheme. The automation concept has been recently extended from the industrial production to support systems for the design, the organization and the management of production. The industrial automation in the widest sense of the term is the integration between automated production and computerized management systems. Pneumatic robotic grippers are among the most suitable organs for applications in industrial handling, in very different fields one another, too. We can think of the handling of dangerous objects in radioactive, submarine or aerospace, agricultural or industrial environment for tiny objects or big masses [18-21]. In figure 4, we can see grippers by the Italian company OMAS, at Druento near Turin (Italy). Fig. 4 – Gripper with parallel (a), angular (b), toggle (c) and self-centring jaws (d) approach. In figure 4(a), we can see a pneumatic self-centring gripper with angular approach. This device is characterized by sturdy and compact architecture that permits its effective use in several applications. In figure 4(b), it is shown a self-centring gripper with parallel closing characterized by a sturdy mechanical structure that houses the adjustable sliding guides, made of hardened, tempered and ground steel. The grip is granted by a gear transmission between cylinder and pliers constituted by a pinion-rack coupling, which confers higher precision and sturdiness features to the gripper than those of grippers with lever transmissions. The increased guide makes it usable also in applications where very long gripping elements are required. In figure 4(c), we can see a pneumatic self-centring gripper with angular approach and toggle transmission that grants the load holding even in absence of feeding pressure of the actuator. 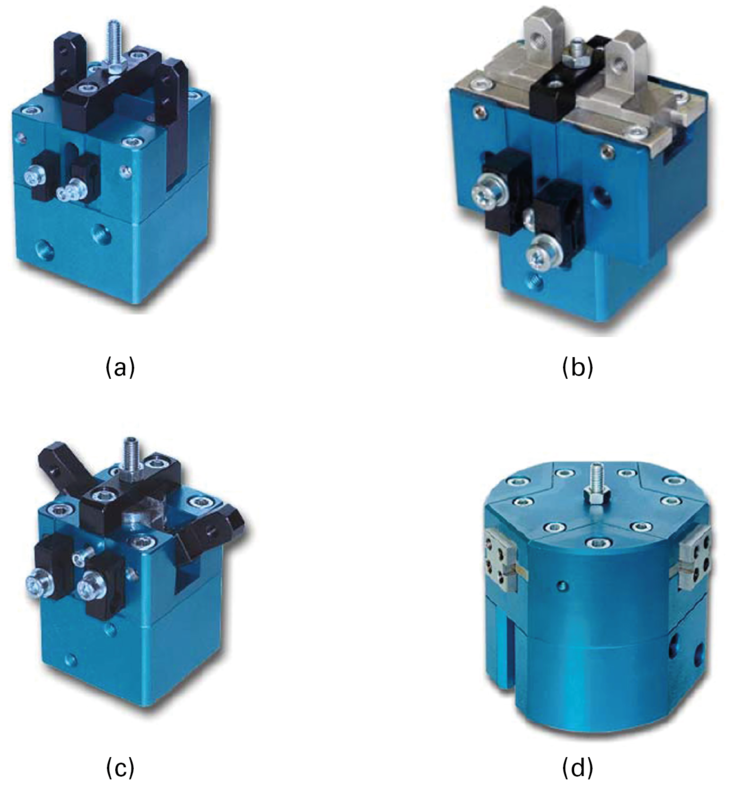 In figure 4(d), we can see a parallel self-centring gripper with 3 jaws, with three adjustable sliding guides made of cemented, hardened and ground steel. The small overall dimensions, in comparison with the loads to be gripped, and the particular structure, which offers protections against the filth infiltration, allow its effective use in heavy applications, also in hostile environment. The grippers represented in figure 4 are totally drawn from the solid on NC machine and are fully treated with thickness anodizing. They are available also with electromagnetic actuator and spring return. Furtheremore, OMAS offers a wide range of pneumatic grippers that can effectively solve problems in manifold fields. The handling and the automatic grip of objects is a sector where pneumatics gives one of the best and most appropriate contributions to industrial robotics. 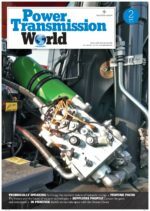 The examples of pneumatic grippers that have effectively solved problems in manifold fields make pneumatic grippers one of the most successful fields in which the automation application sees pneumatics as an undisputed protagonist. Both the manufacturing and the process industry will tend to integrate the automation of production plants and of the activities supporting production; this will result in an important development of the systems constituting the interface between production control systems and resource planning systems with higher automation, also at productive level. The author thanks the Company OMAS, at Druento, near Turin, for the information and the photographic material. Some of the described researches have been funded by the Ministry of Education, University and Research. We Konte is a trading company with four factories. We have Pneumatic/Electric Actuator, Ball/Butterfly/Angle Seat/Diaphragm/Instrument/API Valves. Rely me for more details plz. Appreciate your reading and time,thank you!